i know i shouldn't compare. not only am i over double the age of the average cycling professional, i was never particularly fast when i was the same age. granted, in the seventies and eighties, no-one had ever heard of or thought of marginal gains and the notion of a brit winning the tour de france was probably a favoured joke amongst stand-up comedians. however, surprisingly enough, that's not quite the comparison i was thinking of. bringing comfort and joy to the cognoscenti, this past weekend saw the opening salvo of the 2019 'spring classics'; omloop het neiuwsblad on saturday, followed quickly by kuurne-brussels-kuurne the very next day. granted, collection of heavy percussive items on sunday pm allowed appreciation of only the last 40km or so of k-b-k, but the appetite was appropriately whetted. from now till late april, i prefer to be referred to as gerben de knecht, while practising my race-face in dubious weather. 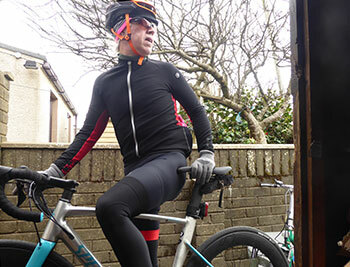 the difference, which i am truly loathe to point out, is that my race-face sits atop a seriously waterproof jacket, while my summer-weight bibshorts were accessorised with leg warmers. would that i bore the chutzpah and thorough belief in rule#5, to ride with bare arms and legs and an insouciant smile. just like the pros. of course, we all know the truth to be very much at odds with that idealised state of affairs, to say nothing of being bereft of a deucininck-quick-step team kit. however, what i did possess and wear, despite the 'summer' classification boldly described on the box, was a pair of assos 'equipe rs bibshorts s9', featuring a natty red hem on the right leg, to match my assos mille gt hashoogi winter jacket. see what i mean? there's immediate mention of a winter jacket, rather than a short-sleeved jersey, as if i could possibly encourage you to think even less of me. but, while it may be necessary to cosy up in the face of freezing galeforce windchill and perpetual rain, to keep that core in battle-ready mode, you understand, the same ministrations are less necessary for the perambulating limbs. i confess that there's no way on this planet that i'd have been out with only shaved legs to show for my efforts; leg warmers are pretty much de rigeur on the outer edge for the foreseeable future, but that doesn't actually mean that bibshorts are persona non grata. 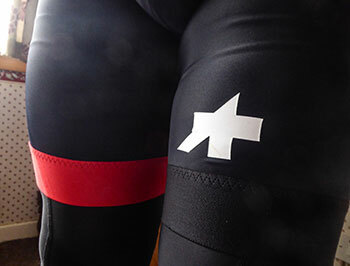 aside from the solitary red hem on one leg, the most obviously unique aspect of assos' latest bibshort release, is probably what would normally be referred to as the 'bib' section. in this case, the upper section of the equipe rs shorts resembles little more than a pair of braces, apparently crossing each other as they do on the back before attaching themselves just above the pad section. disappointingly, the only one to see this well thought-out idiosyncracy, was mrs washingmachinepost. none of our mirrrors are long enough, and i couldn't quite twist my neck that far round. the shorts employ what assos refer to as their 'a-lock engineering'. the s9 range feature but two panels; one wraps the legs, while the other takes care of the pad section. it's worth pointing out at this juncture, that the pad has surely to be one of the most comfortable on the market, if a tad more noticeable in use than several of its peers. however, please know that this is a good thing. the crossover straps form a part of assos' race-car metaphor, where they liken the construction to that of a roll bar, stabilised by the unique bib straps. of course, whether you take assos' word for this or not, really makes no nevermind. even in thoroughly inclement weather conditions, the shorts perform every bit as well, if not better, than you'd expect from switzerland's premier cycling apparel provider. though the rearmost straps describe an 'x', in truth the lower 'a' section is cast from a single section of elastic. 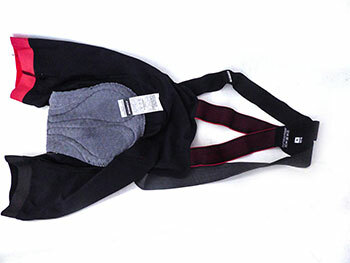 by constructing the bib straps in this fashion, they have limited the vertical stretch at the rear, thus increasing stability. 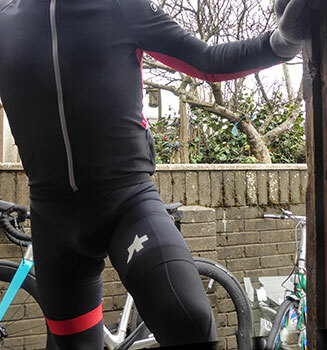 as mentioned above, i was perhaps more aware of the existence of the pad than has been the case with other assos bibs, but, to be honest, the comfort on offer bears being noticed. the fit is exemplary, without noticeable restriction, yet on receiving a thorough soaking, the incorporation of the previously listed new technology kept them firmly in place, ensuring that the term 'rock'n'roll remains solely applicable to a genre of music. given the lengthy heritage presented by the humble pair of cycle shorts, you'd be forgiven for thinking there is little room to manouevre when time comes to invent previously unseen improvements. yet, the equipe rs bibshorts seem to have managed the improbable with panache and style, even if a portion of the latter is mostly hidden from view. the assos equipe rs bibshorts s9 are available in black with red detailing, or all black and in sizes ranging from xs to xl at a retail price of £175. though i would generally leave the world of offroad to those more qualified, it's hard to ignore an apparent crossover between universes, with the ever-increasing popularity of cyclocross and the ubiquitous gravel bike. from a roadie's point of view, taking into account this weekend's strade bianche and a preponderance of cobbles and gravel seeping their way into once pristine road races, i fear that my continued disregard for the rough over the smooth, may be in danger of appearing as ignorance at best or arrogance at worst. though it may seem hard to believe, the inhabitants of offroad appear to have differing apparel needs, than that applicable to ourselves. for example, two of the more obvious variations revolve around a lack of rear pockets (which somewhat mystifies me to this day) and sleeves that offer little grasp of wimp-like biceps. however, it ill behoves the intrepid cycle clothing apparel purveyor to ignore this apparently pressing need amongst the genre's aficionados. 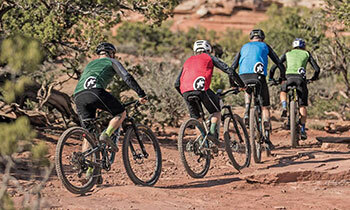 to this end, assos are today unveiling their trail kit aimed squarely at the mtb/gravel market, a range consisting of jerseys, cargo shorts, arm and knee protectors and gloves. for those of you who have a predilection for this sort of cycling, and i don't entirely discount myself from that realm, pop over to assos.com for a squint at all that's on offer.